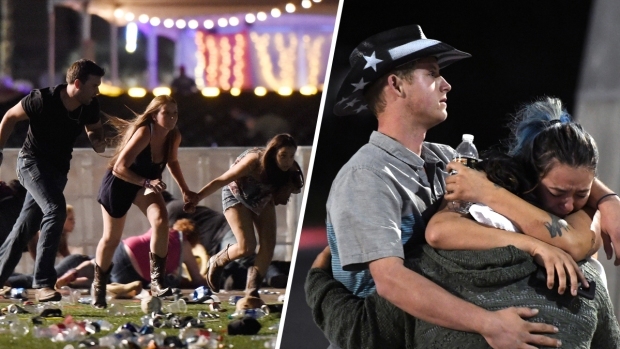 59 Killed - Las Vegas, Nevada (Oct. 1, 2017) - A gunman on the 32nd floor of a Las Vegas strip casino fired down on a country music festival below, killing at least 58 people and wounding 515, according to authorities. The suspected gunman, Stephen Paddock, killed himself at the scene, police said. 49 Killed - Orlando, Florida (June 12, 2016) - Forty-nine people were killed and 53 wounded in a shooting at the Pulse nightclub. Gunman Omar Mateen was killed after taking hostages. 32 Killed - Blacksburg, Virginia (April 16, 2007) - Thirty-two people were killed and 17 wounded in a shooting on the Virginia Tech campus by gunman Seung-Hui Cho, who also fatally shot himself. 26 Killed - Newtown, Connecticut (Dec. 14, 2012) - Twenty-six people, including 20 children, were killed at Sandy Hook Elementary School. Gunman Adam Lanza killed his mother before the shooting and later fatally shot himself. 23 Killed - Killeen, Texas (Oct. 16, 1991) - Twenty-three people were killed and 20 injured when George Hennard crashed his pickup into Luby's Cafeteria then opened fire on customers before fatally shooting himself. 21 Killed - San Ysidro, California (July 18, 1984) - Twenty-one people were killed and 19 injured at a San Diego McDonald's. James Huberty was killed by police. 17 Killed - Austin, Texas (Aug. 1, 1966) - Thirteen people were killed and more than 30 others wounded when student Charles Whitman opened fire from the 28th floor of the University of Texas campus tower then was killed by police. Seventeen deaths were ultimately attributed to the shooting. 14 Killed - San Bernardino, California (Dec. 2, 2015) - Fourteen people were killed and 22 wounded at a meeting of San Bernardino County employees. Husband-and-wife suspects Syed Rizwan Farook and Tashfeen Malik were killed in a gunfight with police. 14 Killed - Edmond, Oklahoma (Aug. 20, 1986) - Postal worker Patrick Sherrill killed 14 co-workers and wounded six others before fatally shooting himself. 13 Killed - Fort Hood, Texas (Nov. 9, 2009) - Thirteen people were killed and more than 30 wounded by Maj. Nidal Hasan, an Army psychiatrist. Hasan was sentenced to death. 13 Killed - Binghamton, New York (April 3, 2009) - Thirteen people killed and four wounded at a citizenship class by gunman Jiverly Antares Wong, who then killed himself. 13 Killed - Littleton, Colorado (April 20, 1999) - Twelve students and one teacher were killed and 20 wounded at Columbine High School. Attackers Eric Harris and Dylan Klebold killed themselves. 12 Killed - Aurora, Colorado (July 20, 2012) - Twelve people were killed and 70 wounded at a movie theater during a midnight showing of "The Dark Knight Rises." Gunman James Holmes, arrested outside the theater, had booby-trapped his home with explosives. He was sentenced to life without the possibility of parole. 12 Killed - Washington, D.C., (Sept. 16, 2013) — Twelve people were killed and eight injured at the Washington Navy Yard. Gunman Aaron Alexis, of Texas, was killed. 9 Killed - Charleston, South Carolina, (June 18, 2015) — Nine people were killed at a prayer meeting at Emanuel African Methodist Episcopal Church, a historic African-American church. Gunman Dylann Roof, a white supremacist, was sentenced to death. CORRECTION (Oct. 2, 2017 1:53 p.m. ET): This article has been updated to fix a typo on the number of those killed in Austin, Texas, and to clarify that 17 deaths were ultimately attributed to the shooting at the University of Texas.